Do you love candles? Maybe you’re thinking about making candles at home to sell. They are fun to make, it’s true! And it’s so lovely to have your house constantly be filled with those wonderful, delightful fragrances! Personally, I did not realize all the work that goes into a soy candle business, or any candle business for that matter, because you soon realize that it is not just about making candles to sell. I don’t want to discourage you. A soy candle making business can be a nice profitable home business for you! But I want to make sure you realize all that goes into it, because if you are just starting out, or just thinking about starting, then you don’t know all the work that goes into candle making, marketing and selling. I Closed My Candle Business, But…. This is the reason I decided to close my business after 4 years. If I didn’t have kids I may have stuck with it, but the fact that I have 3 boys (I only had 2 when I first started my soy candle business) and was working my business and trying to homeschool, and on top of that, living in a small home, I had to make a choice on what my priorities were and I decided I wasn’t enjoying the whole candle business all that much anymore even though business kept growing, so I closed the doors. In fact it was because of the growing customers that I decided to call it quits. The more customers the more busy it got and I didn’t have anyone to help me with it all! That does not mean that you can’t do it, and enjoy it though! Everyone is different and this business can work for you! What Goes into Making Soy Candles at Home to Sell? Below is a rundown of all the things involved with making soy candles at home to sell along with marketing your business. If you can outsource a few of these things, it will make your soy candle business so much less stressful and you can focus more on your candle making! Thinking and thinking and thinking about this, that and everything to do with soy candles! As I said before, if you can afford to pay someone to do some of those things above, or you have a partner to help, a good size kitchen(better yet a separate area to work), then you will probably have a much easier time with your home candle business. I know I might have caused some doubt in your mind of whether you want to even try this business, but really, you won’t know until you try. I loved it the first 2 years, it’s just that I had so many other things I was trying to do too, so the home candle business just didn’t end up fitting with the lifestyle I wanted. I hope I’ve made you seriously consider some things and if you think you want to give it a go, then go for it! Procrastinating will get you nowhere, and, like I said, you won’t know until you try! Starting a Candle Business Learn what you need to do to start a candle making business in this 3 part series. Don’t start your candle business without learning as much as you can first! 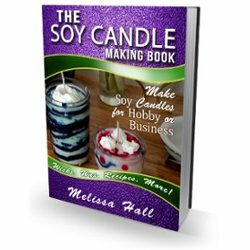 What if you had a tool that could help you get started making soy candles for your business right now? Would you like to save a ton of time that you could be using to work on starting your business instead of searching all over trying to find how to make this kind of soy candle, or that kind, or how to find the best wick, what supplier to use and so on, etc… etc…? That is exactly why I created my new eBook “The Soy Candle Making Book” You can download the book and have everything you need to make amazing soy candles that your customers will love! No need to go searching around the net for every piece of information because it’s all right here! Click Here to get this incredible book today! I like reading your tip pages, and I wish you would do some of your YouTube videos on the business side of candles. I am just starting and can’t afford your book right now but hoping I can someday. You have helped me make my decision to do this. Roxanne, so sorry I didn’t see your post until now to approve it and reply to you! I do have plans to focus more on the business side this year and want to get some videos done for building a web store and other things. Hope you are doing well! Flee markets could definitely be a great way to sell candles. We don’t have much in the way of flee markets around here where I live, so I’ve never tried it, but I imagine it is probably similar to a Saturday market, so you might check out my post on selling at Saturday Market for some tips: https://www.soycandlemakingtime.com/selling-soy-candles-at-saturday-market/ You might stop by those flee markets and see if anyone else is selling candles. If not, this could be a good or bad thing. It could mean that others have tried selling candles there, but they didn’t sell well, or maybe there just aren’t really any candle makers in the area, which could be good for you. If there are others selling candles there, that is probably a sign that it could be a good market to sell at. Hi Mitchell, Can I be cheeky & ask if you make much money from selling your candles?